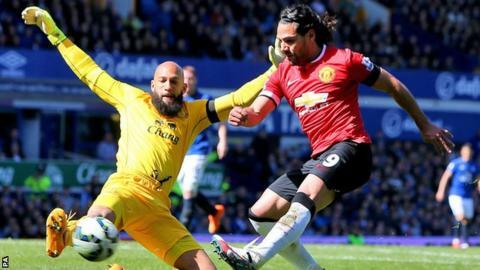 Radamel Falcao's mother has said the striker is "unhappy" at Manchester United and could leave in the summer. The Colombian joined United on-loan from Monaco in September but has scored just four goals in 28 appearances. Falcao, 29, has only started one of United's last eight Premier League matches - the 1-0 loss at Chelsea. "Even if he's unhappy not to be in the starting XI, he has to accept the coach's decisions," Carmenza Zarate told Colombian newspaper El Espectador. "I often remind him that after a test or a difficulty, blessings arrive. If God shows him a new path, he'll leave Manchester; if not, he'll stay. We hope for bigger and better things. "God hasn't abandoned us and my son will become again what he has been, a goal scorer." Before his move to Old Trafford, Falcao was one of the most prolific strikers in the world with 104 goals in 139 games for Porto, Atletico Madrid and Monaco. He suffered an anterior cruciate ligament in January 2014 that kept him out of the World Cup before joining United in September. However, Falcao, who earns approximately £265,000-a-week at United, has not scored since his goal against Leicester City on 31 January. Ms Zarate added: "It's not a normal situation given what he has experienced in his career, but it happens in football. "Not everything has been easy in Falcao's life. He has had some difficult moments in his career. "They slowed his progress and prevented him from participating in important competitions like the World Cup, or have confined him to the bench, like in Manchester."